✩ Life ❣ Beauty ❣ Food ✩: JB (Tuas) custom is crap! They were supposed to reach earlier cos they left the petrol kiosk 15-20 mins earlier than me as we went to pack food home. 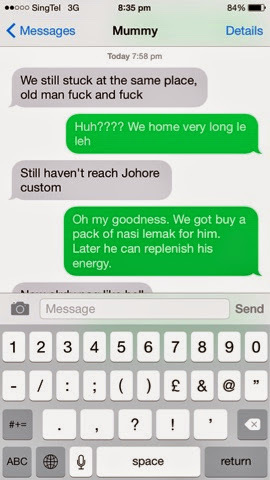 Luckily I saw my bro's msg while packing food. My dad was already stuck in the middle, inside the jam. I did a mega cut & squeeze via bus lane, so I managed to cross both customs in 40 mins! I'm not a noob lady driver by the way, that's why I hate it when men always criticise lady drivers. Like oh pls, some men are worse can! Anyway, I SURVIVED THE RIDE!! We returned safe and sound, including my car. I drove for around 14 hours in two days, very very tiring. The kids asked, "can we go again?" I was like omg, don't kid me anymore. Lolol, that was how scary it is!!! Can go lah, but not during the school holiday. The jam and the crowd are horrible!!! I've plenty of backdated posts! But I'm really busy and tired. I need a rest now!